Pro Shot Alpha XD Rotary Laser. Pro Shot Alpha XD Rotary Level Laser with Detector When taking extremely long grade shots is a must (3300' diam) Accuracy (� 1/16" per 100') Includes Free shipping from Tri County Transit. 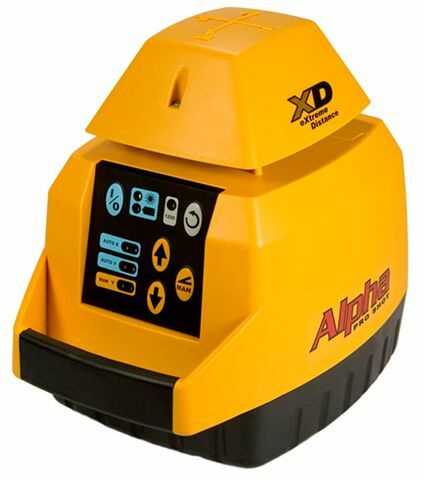 Pro Shot Alpha XD Rotary Laser offers Servo self leveling, high performance, rugged design and extreme distance. When taking extremely long grade shots is a must, the Pro Shot� Alpha XD construction laser provides the industry leading performance you need. All of the great features and specs from the standard Alpha, plus a 3300ft (1km) radius coverage area. Specifications 3300� dia., 1650� rad. (1km/500m) � 10 arc sec. (� 1/16" per 100') (� 1.5mm per 30m) Servo motor � � 5 degrees Single axis, X-axis self-leveled � 8% Normally active, can be disabled 360� � 600 or 1200rpm. selectable Yes, including high speed rotation 24 Month defects coverage Four C-cells � 90 hrs. (alkaline) Optional Ni-Mh kit � 65 hrs. Visible 670nm CDRH class IIIa � IEC class 3R To international standard IP56 -4� F to +140� F (-20� C to +60� C) Designed to withstand a 3ft (1m) drop or 5ft (1.5m) tripod knock-over on concrete XD range - R8 laser receiver . Accuracy 1/16" in 100ft Self leveling type � Slope matching � Range 3300ft dia........ Height alert . Rotation coverage 360 deg. � speed 600 or 1200 rpm .... Machine control compatible ... Warranty..24 mos against factory defects. Power source � Life 4 c cells 90hrs. Rechargeable batts. optional� Life 65 hrs. Laser beam type visable .. Dust and water sealed . Built to be jobsite tough. rotary laser system include R7 receiver, instruction book, and carrying case. We carry Pro Shot rotary lasers, which make you a one person leveling crew. They give you one person grade checking and elevation control. We have lasers for grading, elevation control, land leveling, drop ceilings and a variety of other applications. Our Pro Shot construction rotary lasers combine affordability, accuracy and a lot of features.